The following meetings and training sessions aim at strengthening our communication efforts concerning current and upcoming campus technologies. We hope you will join us. This event facilitates conversations about technologies on our campus. We invite you to come with your ideas and questions. Light refreshments and desserts will be served. This lunchtime event focuses around a particular topic. Topics relate to current technologies and focus on how those technologies impact our community. 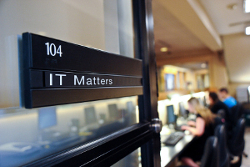 The next IT Forum will be in Fall 2019. For questions, please email julie.brackeva-phillips@scranton.edu.